Okay, if you’ve seen our posts on the northern Oregon coast and the central Oregon coast, you probably won’t be surprised to discover that there is a TON of stuff to do in the southern Oregon coast as well. True to form, there are way more than five reasons to make the drive to some of the most remote stretches of coastline in the state. It may be more apt to consider these suggestions for five great places to stop once you’re there; at each stop you’ll be enticed to do plenty more. If you plan on spending a few nights in the area, Bastendorff Beach County Campground is near the north end of adventures in this list, Bullards Beach State Park Campground is near the middle, and Humbug Mountain State Park Campground is near the south end. This portion of the Oregon coast is blessed with some of the most temperate (albeit mercurial) weather in the state, and the distances from major cities usually translate into a little less traffic, especially in the off-seasons. 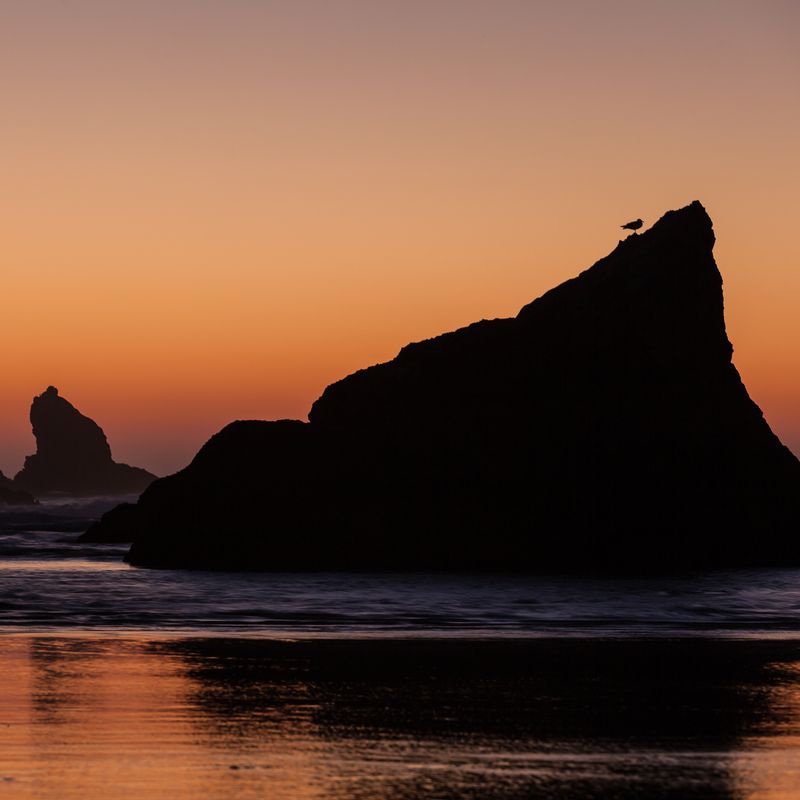 If majestic views, unreal rock formations, exclusive wildlife and habitat access, and broad, sandy beaches pique your interests even a little bit, do yourself a favor and plan to spend some time on the southern Oregon coast. The calm cove at Sunset Bay State Park. Photo by Halvor Tweto. 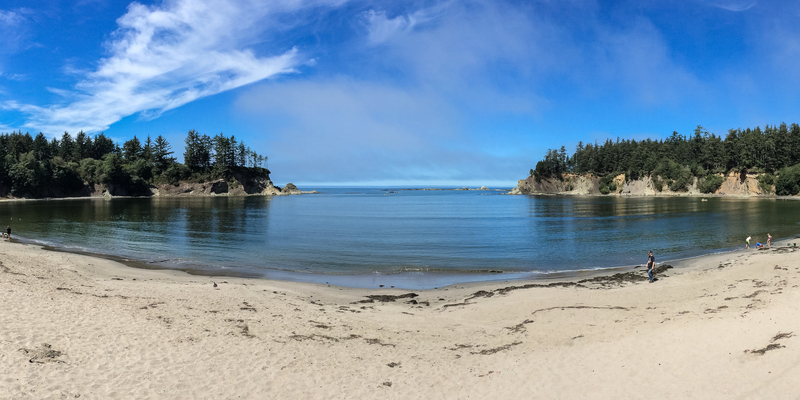 Each stop in the string of state parks on Cape Arago south of Coos Bay is incredible in its own right, and the opportunity to see them all together along the same stretch of coast is simply too good to pass up. Believe it or not, these three parks were all part of lumberman Louis Simpson’s enormous estate before the land was turned over to the public. Enjoy an idyllic day on the beach with the family at Sunset Bay, head to Shore Acres itself during a storm for some of the most intense wave action along the coast, or check out Cape Arago for whale watching and unparalleled views south toward Cape Blanco. And don’t pass the Simpson Reef Overlook without stopping to see (hear, and smell) some of the local wildlife hauled out on the rocks. 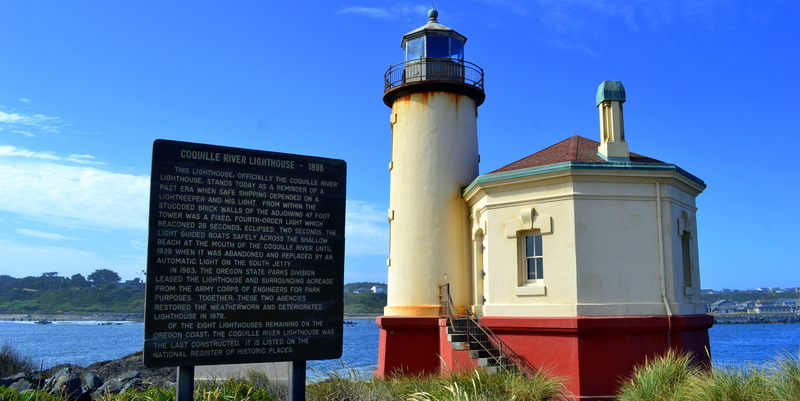 The Coquille River Lighthouse in Bullards Beach State Park. Photo by Robyn Anderson. Located just north of Bandon, Bullards Beach State Park Campground is a great base from which to explore the area. But the state park itself has plenty to stop for even if you stay elsewhere. You’ll find a first-rate boat ramp onto the Coquille River, and the park is ideally situated for paddles upstream to the ramp at Rocky Point or downstream to Bandon depending on the tides. Drive a little deeper into the park for the first access to Bullards Beach, or keep going for easy parking at the Coquille River Lighthouse and north jetty. A walk out to the tip of this jetty will give you a bit of respect for the endurance of this squat little lighthouse that is stationed at the turbulent mouth of the Coquille River. Stairs lead from Coquille Point down to the beach. Photo by Halvor Tweto. The stretch of beach between Coquille Point and Face Rock is one of Oregon’s most photographed places, and for good reason. Wind, rain, and waves have worked for millennia to erode sea stacks into the most unlikely of shapes. A sunset here won’t soon be forgotten. But be sure to check out Coquille Point earlier in the day, and bring some binoculars; this small headland is the only point of access into the Oregon Islands National Wildlife Refuge along the entire Oregon coast. 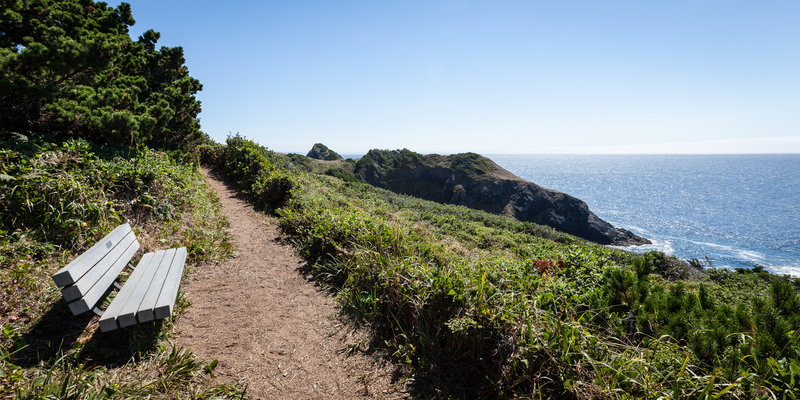 Views for miles from Port Orford Heads State Park. Photo by Halvor Tweto. 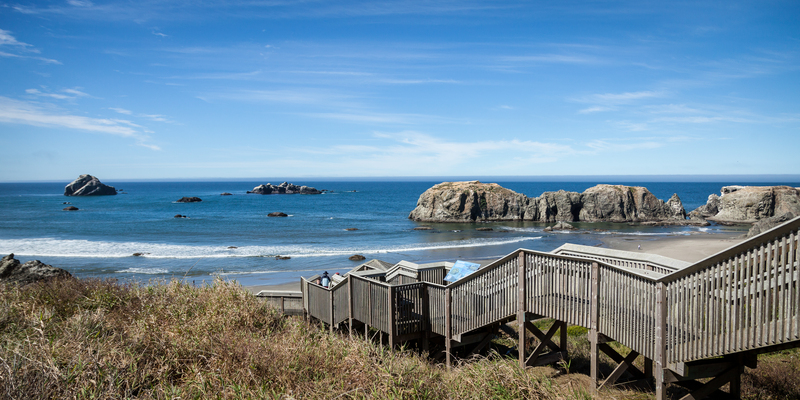 If you find yourself visiting Port Orford on a sunny day, don’t be surprised if you start looking for ways to make a more permanent move. This little town is a gem, and it is surrounded by some stunning scenery. Port Orford Heads State Park is just up the hill, and the short system of trails there provides excellent views of the headland and the coastline to the north and south. You’ll also get the chance to learn about some of the early history of the Coast Guard in this region if you show up when the museum is open. Once you’re finished on the hill, head to Battle Rock Park, the beach that is just south of town, for a walk near rocks that resemble those at Face Rock. The surf is occasionally good here, so the black bodies swimming in the waves may not just be seals. And don’t overlook the small beach and cave just north of the beach’s main entrance. Enjoying the sunset from Whaleshead Beach. Photo by Shane Kucera. This is an essential stop if you are exploring the region near Brookings. Whaleshead was named for the wave action that sometimes shoots water into the air as waves crash into the sea stacks off of the beach, and it is an incredible place to catch a sunset. Come in the afternoon to enjoy a picnic and cruise up the short forest trails for higher perspectives on the sea stacks, then get down to the water to watch the sun fall between these two distinctive rocks. 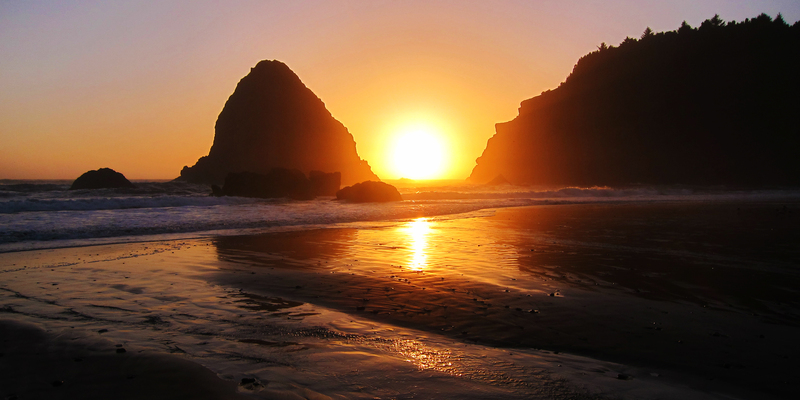 Let us know where you like to hang out on the southern Oregon coast! Drop us a line and leave a photo in the comment section if you can, we’d love to see it. And have a look at the first two installments in this series covering the northern and central regions for more great adventure ideas.